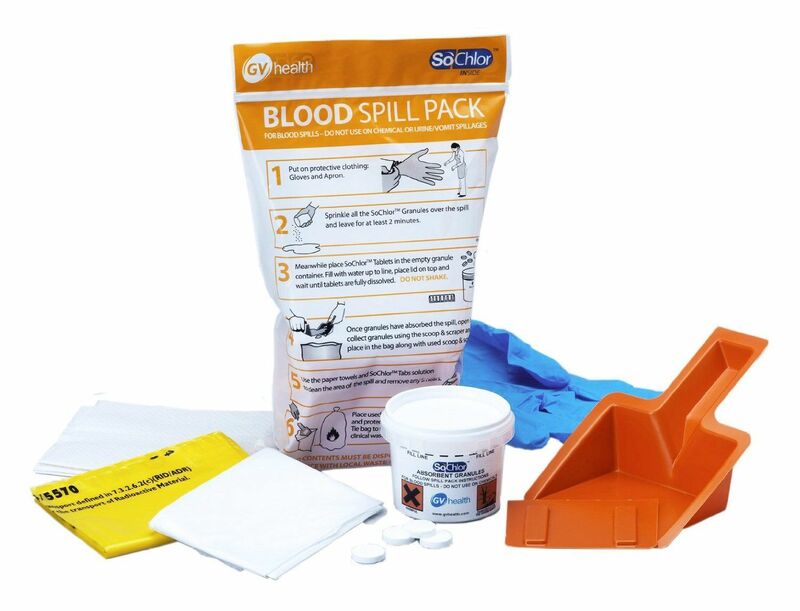 GV Health Blood Spill single-use packs remove and disinfect blood spillages. They are safe for use by non-specialist staff with clear and easy to follow illustrative instructions. Pack conforms to Department of Health & WHO recommendations for safe disinfection and clean up of blood spills. This product is used throughout the NHS under contract as well as in clinics, dental surgeries, carehomes, schools and veterinary. Certified with test standards: BS:EN1650, BS:EN1276 & BS:EN13697. SoChlor Chlorine Tabs: SoChlor Tabs are formulated using Sodium Dichloroisocyanurate (NaDCC). Chlorine solutions made from NaDCC are effective when deployed on organic matter such as blood. Diluted to 10,000ppm SoChlor Tabs meet the recommended strength for blood spill disinfection as stipulated by the World Health Organisation(WHO).